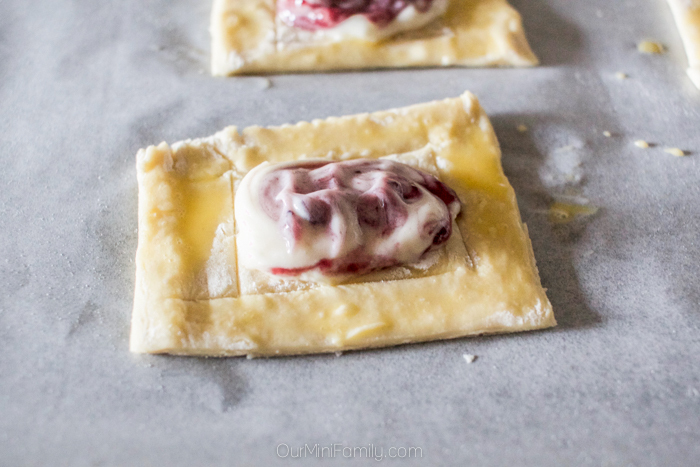 These blueberry cream cheese danishes are so easy to make, and are a perfect treat to enjoy at home! This simple and deliciously tempting danish recipe is inspired by my recently sponsored partnership with Left Field Farms. After going on our first trip of the year, Adam and I have been enjoying spending time at home and taking it easy after having such a hectic but incredibly epic and adventurous week last week! Normally, we prefer to spend brunch together outside of our home and go out to enjoy an outdoor patio since the weather is so beautiful this time of year here in Phoenix. But since we came back from our trip, we have become homebodies again this week and been relaxing in our pajamas and comfy clothes at home (so the last thing on our minds is to get dressed up and go out for brunch). Right after we came back from our trip, we resumed our brunch tradition but had it here at home instead with a cup of coffee prepared with Left Field Farms Non-GMO Creamer and these beautiful and tasty blueberry cream cheese danishes that I made for us! And be sure to grab this Ibotta offer while supplies last! We recently discovered Left Field Farms Non-GMO Creamer at our neighbhoord Walmart and we've been using it ever since! 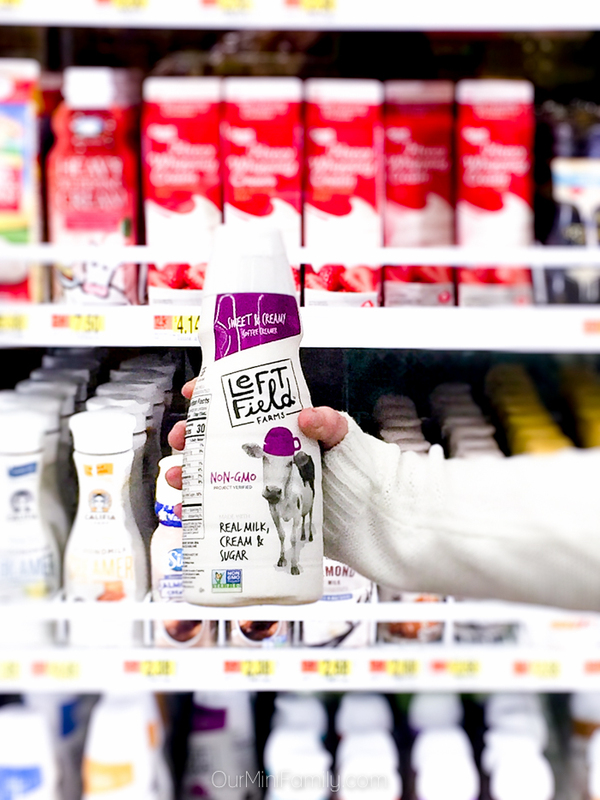 We're always on the hunt for a new creamer to try to take our coffee and baked goods to the next level, and this Left Field Farms Non-GMO Creamer has done just that for us. 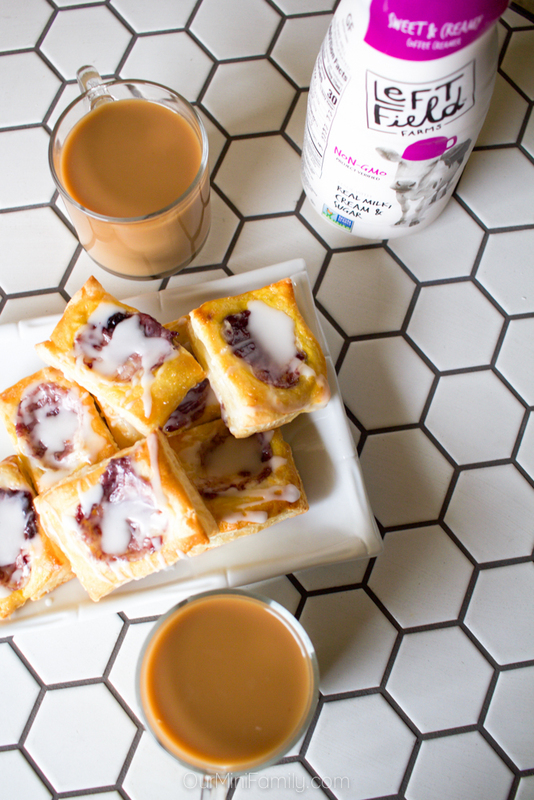 It's made with real cream, real sugar, and it is non-gmo project verified so I feel like I'm making the right decision whenever I pour something into my morning cup or whip up these tasty blueberry cream cheese danishes and other delicious baked goods that are enhanced with creamer in their recipe! There are a few different flavors you can choose from including vanilla, caramel, and sweet and creamy at Walmart. 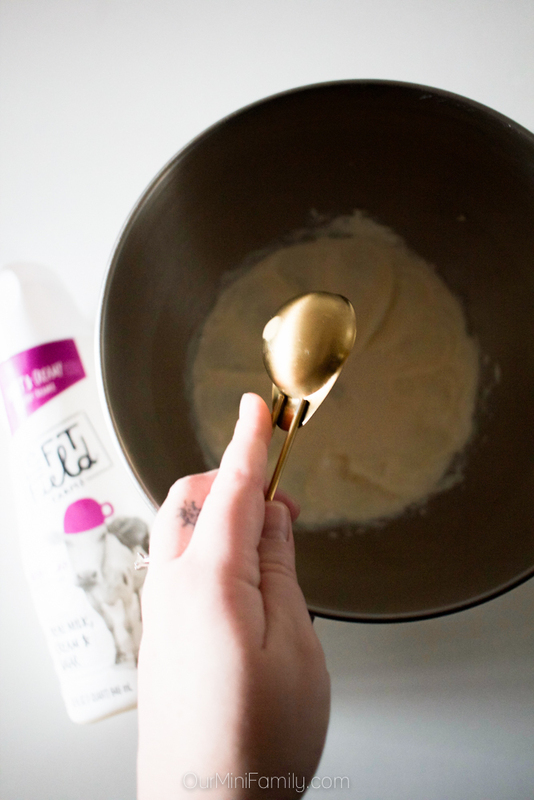 Our favorite, which we think is the most diverse to use, is the sweet and creamy one! 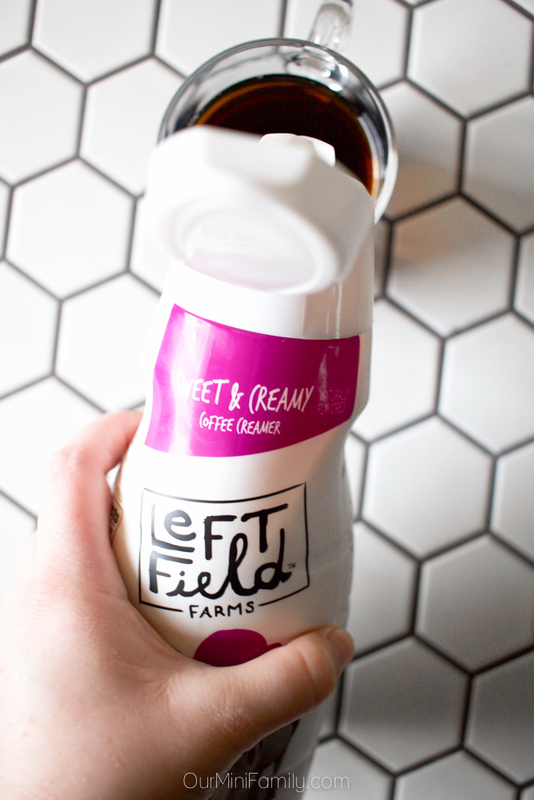 You can learn more about Left Field Farms Non-GMO Creamer and get an Ibotta rebate on Left Field Farms Non-GMO Creamer here while supplies last! 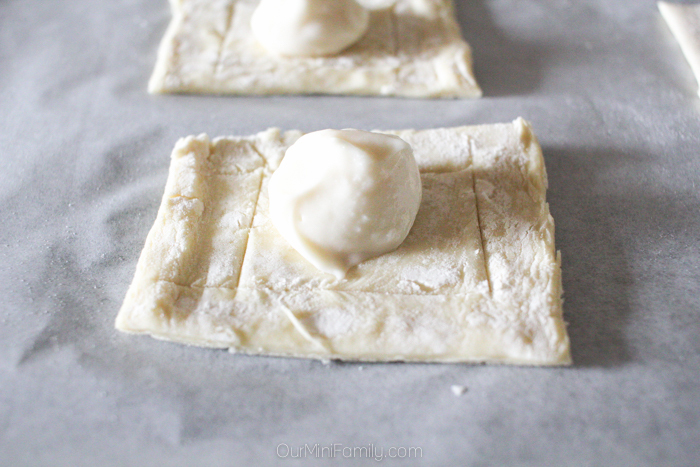 If you are using frozen pre-made puff pastry, make sure that it is completely thawed. It usually takes about 15-20 minutes at room temperature to thaw. In a mixing bowl, soften and beat the sugar and cream cheese until it is well-mixed and smooth. If you have an electric mixer, this may take up to 1-2 minutes on low-medium speed. By hand, this may take up to 3-5 minutes. Add in the Left Field Farms Non-GMO Creamer and vanilla extract and mix it in. Set aside. 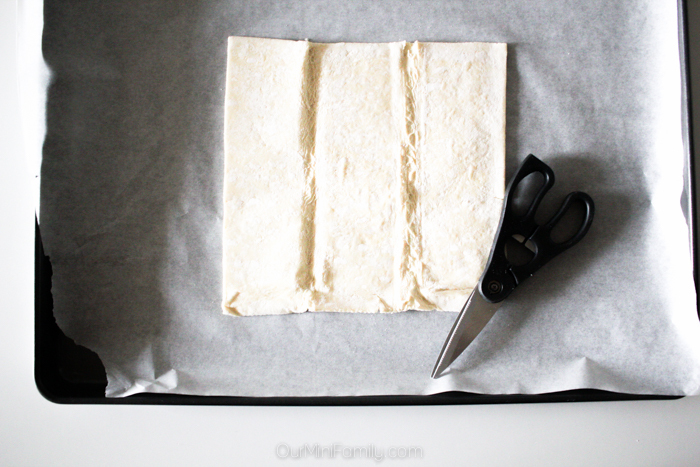 Unfold your puff pastry and cut it into rectangles about 4 inches by 3 inches (if you are using frozen puff pastry, this is the same as cutting it into four equal parts). 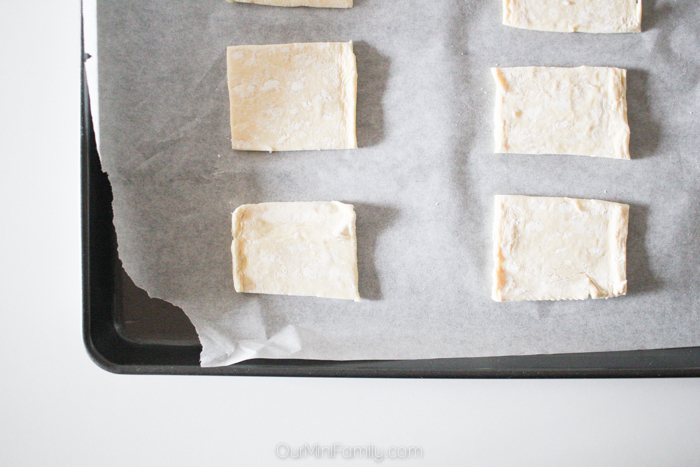 Line a non-stick baking sheet with the puff pastry squares (baking wax sheet preferred). 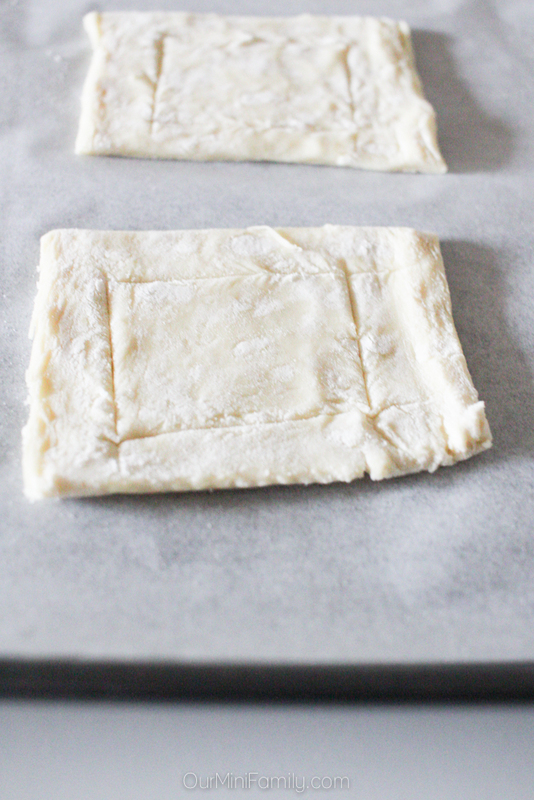 Using a knife, score an inner rectangle in the middle of each pastry (as shown in my pictures). 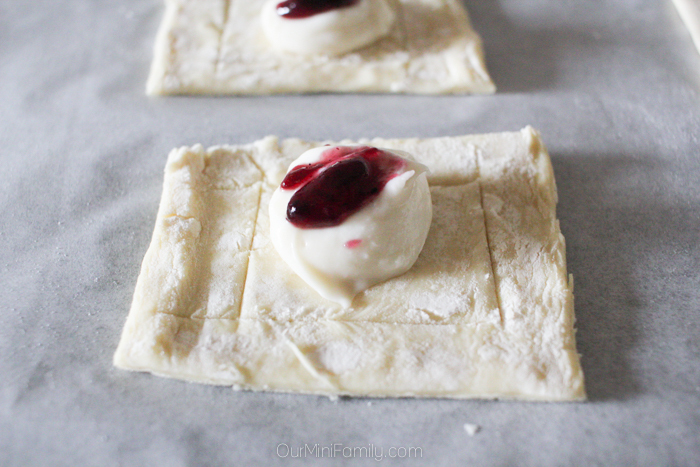 Don't cut it all of the way through the pastry, but just enough to get a defined border. Scoop about 1 tablespoon worth of filling onto the center of the pastries inside the scored middle. Drizzle a handful of drops of jam on top and use a toothpick the jam into the filling. Using a small bowl, crack an egg into it and add 1 tablespoon of water. Beat the egg and water together to create an egg wash. Brush the egg-water mixture over the outside edge of the pastries (do not put the egg wash on the filling or jam). Bake the pastries in the oven at 400 degrees (F) for 12-14 minutes or until the pastry is a light, golden brown color. The pastry will puff up and turn golden when it is done. Once the pastries are baked, remove them from the oven and set them aside to cool. Prepare the icing while the pastries cool (should only take 2-3 minutes for the icing to be complete). In a mixing bowl, combine the powdered sugar and water and mix well. If the icing is too thin, add small amounts of powdered sugar until it is your desired texture (and if the issue is that the icing is too thick, add small amounts of water until you get your desired texture). Once the icing is the right thickness, drizzle it all over the pastries and serve. Enjoy! Don't forget to share this recipe idea on Pinterest and Facebook! 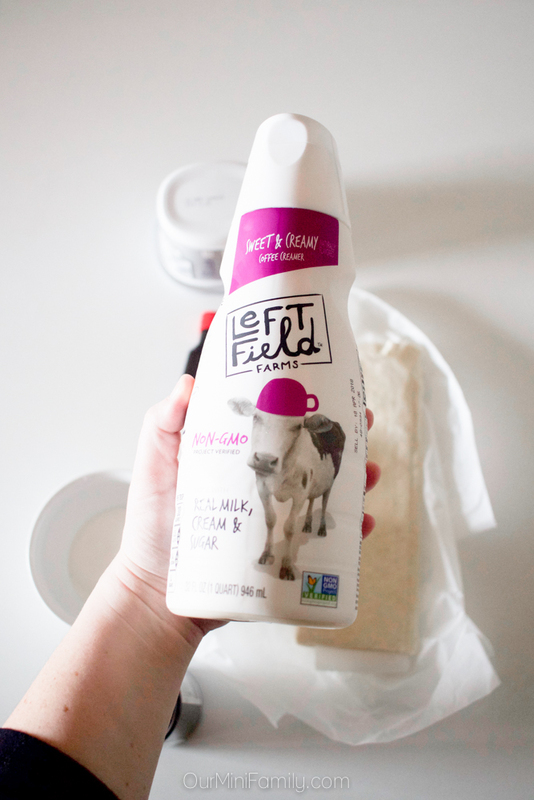 Learn more about Left Field Farms Non-GMO Creamer here! And take advantage of THIS Ibotta offer while supplies last! This danish looks really tasty. I wish I wasn't on a no-carb diet, because I would eat the whole batch! That looks absolutely fantastic! Fruity danish is my favorite thing in the world. I can't wait to make this! Yay! I thought I was the only one who used coffee creamer in recipes and strange ways! So happy to see this and OH MY this danish looks good! Thanks for the yummy recipe! I love the idea of using coffee creamer in a recipe! I don't do it enough. I haven't tried using creamer in recipes. I usually add vanilla and sugar when I make blueberry pancakes. I think next time, I will add some creamer to it instead. Then I can leave out the vanilla and sugar. These look so yummy! I absolutely love danishes. This looks delicious. I would never have thought to add creamer into it! I bought cream cheese danish at the store before and I loved it. It was so good. I didn't know it is so easy to make. I am going to try your recipe soon. Wow this looks so freaking good! Maybe I'll buy the ingredients and try to make these for Sunday morning! This looks AMAZING! 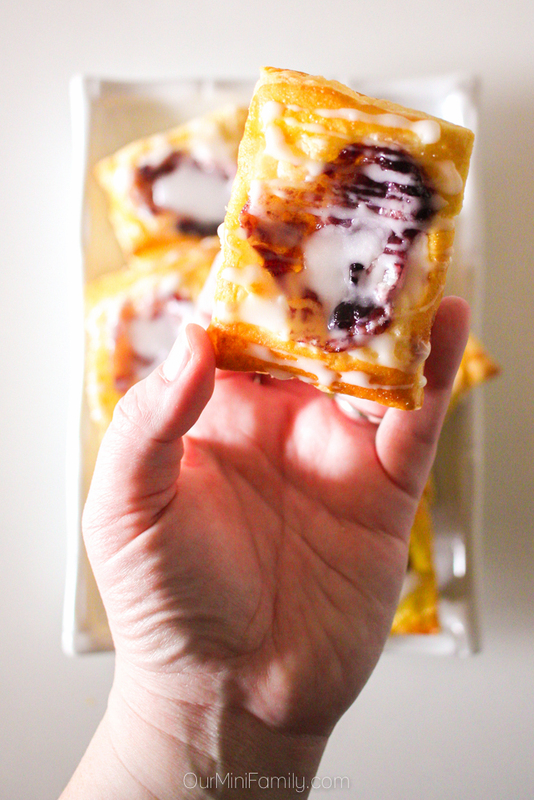 I love anything cream cheese, and a blueberry cream cheese danish is even better. YUM!